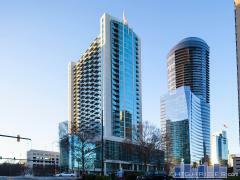 The Concorde is 31 stories of Buckhead luxury living. Walking distance to bars, shops and restaurants, convenience is key. In addition to fine condos with floor to ceiling windows and spacious floor plans, The Concorde offers an outstanding amenities list: lighted rooftop tennis courts, swimming pool, fitness center, 24 hour concierge and on-site management are just the beginning. There are also no pet restrictions at The Concorde. Have any comments or questions about The Concorde? Ask your question and/or share your thoughts about this Building. Once you purchase a unit are you able to lease it out?